Axcess Tree Services provide a stump grinding and stump removal service to customers throughout Wrexham, Shrewsbury Ellesmere Port, Wirral, Chester and all surrounding areas within Cheshire, Shropshire and North Wales. 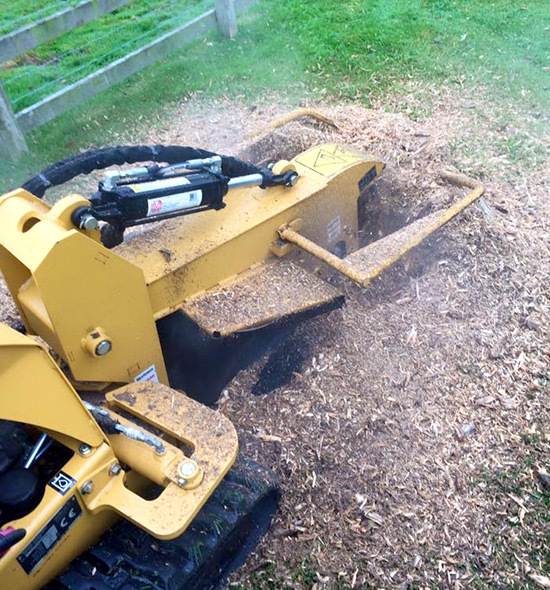 Tree stump removal services are available using a range of stump grinders to suit all tree stumps and locations. Stump grinding is a quick and efficient method of removing unwanted tree stumps which can help prevent the spread of fungal diseases such as honey fungas to neighbouring trees. Stump grinding involves the removal of stump to a specified depth, generally between 150m and 300m. Upon completion of stump removal, the remaining hole will be back-filled with soil or grinding waste to leave a level surface. If required, Axcess Tree Services can arrange the checking of underground services prior to commencing any works to ensure they are safeguarded during the stump grinding process. Where stump removal is unfeasible or not required, tree stumps can be killed using suitable stump treatments to prevent re-growth.